Ergoresearch owns patents in the field of orthotics and prosthetics (O&P), including intellectual property used in the Power Knee, the world’s only motor-powered prosthesis for above-knee amputees. The Power Knee is distributed under license agreement by Össur, a global leader in the O&P market. The Company also has a royalty agreement related to the Neurostep® System and neuromodulation products in other indications (sleep apnea and epilepsy) using the Neurobionix technology platform under development by Neurostream Technologies, a general partnership now owned by Ottobock, a global leader in the O&P market. Human bionics is a discipline dedicated to the creation of devices that can instantaneously interact with the human body in order to replace lost or restore biomechanical or physiological functions. To achieve this objective, bionic devices must contain components capable of measuring the behavior of targeted bodily functions, interpreting such measurement via artificial intelligence and providing appropriate instructions. The Power Knee restores lost muscle function and enables amputees to perform normal daily activities. 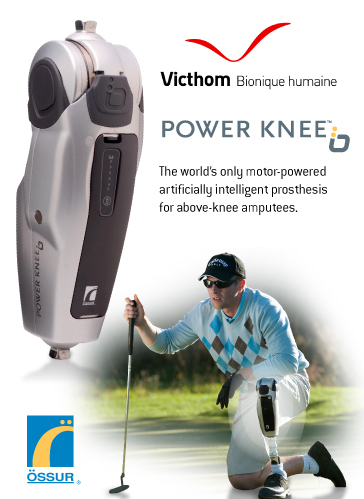 Victhom’s partner and exclusive distributor in this area, Össur, already proceeded with the limited commercial launch of the second-generation Power Knee early in 2011 and is preparing for the full commercial launch.